It was even colder after this morning's swim than after yesterday's. 18 degrees! I ended up sitting in the car with the heat on for quite a while, because I went to meet the woman who gave me the owl dish a couple of months ago. 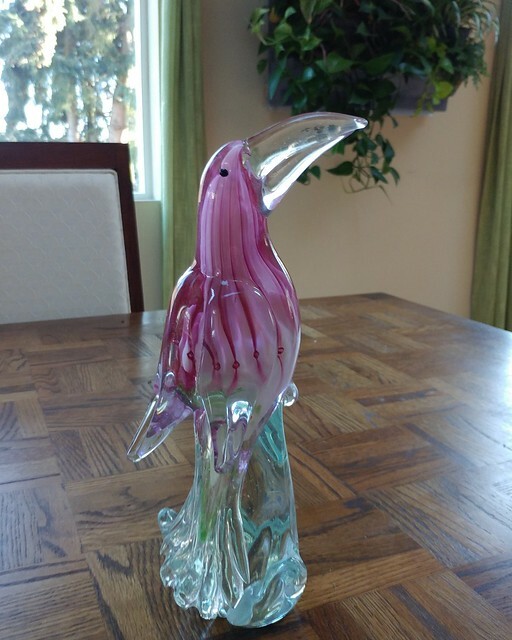 She recently had a glass bird on our Buy Nothing group that I wanted, but I couldn't go pick it up that night because I'd already had wine by the time I saw her post. She contacted me yesterday to let me know she saved it for me because she likes the air plant I gave her last time so much, so the plan was that I'd head over after my swim. Unfortunately, she didn't realize her Messenger alerts were off, so after ten minutes I left. She got in touch a while later, and after I had lunch with my friend Kristen, I picked it up. It's so tacky, I love it. It'll live our on the deck with one of our metal roosters. After three days of swimming and yoga (both every day) I may attempt a walk in the morning. The timing of this cold snap has been good because I wasn't out there each morning, but we won't be all the way out of it tomorrow. The forecasted low temperature is 27, which is certainly better than 18, so that's good. I'd swim, but I asked one of the lifeguards if the annoying team has been around, and she said they switched to Fridays, but it's been a few weeks. And I can't do the noon session because I'm picking Barbara up at noon to take her out for lunch and grocery shopping. I got a lot of work done today, as well as my weekly chores. There are a few other things I could get done, but I need a break.